I have finally finished Part Two! You can read Part One here. I apologize, this is hardly a masterpiece, but it provides some concrete examples of things we can begin to advocate for that keeps the success of businesses (small, giant and everything in between) in mind. BE SURE TO COMMENT if you have questions or ideas or criticisms. I want to advocate for honest and real solutions! If you are going to advocate for a strengthened family unit-based society (which I do) childcare access in single parent and two parent homes is an important factor. Currently, most businesses run according to the needs of the business. How else would they make money? We have set business hours and office commutes. This all works out great when families are not involved. Once the employee is a parent, however, things can be complicated. It is more and more difficult to support a family on one income, and we have discussed what a family and a job mean for single parents already. So how can we work to make businesses more family-friendly? o Onsite care or facilities provided by a separate entity where a partnership/contract is entered. The thought here would be that the upfront cost of a childcare contract would be smaller than the cost of lost hours and employee turnover. This sort of arrangement would help defray the costs for employees, thus freeing up wages to, you know, live. - Flexible schedules: While I realize business hours are business hours, rigid hours are not conducive to family life. A little flexibility goes a long way in allowing a parent time to take their child to the doctor, or pick them up when they are sick, etc. Flexible does not mean that there is no consistency, however. - Telecommuting/working from home: While this is something primarily for management or office jobs, allowing the flexibility for employees to work from home a few hours a week is also an option. 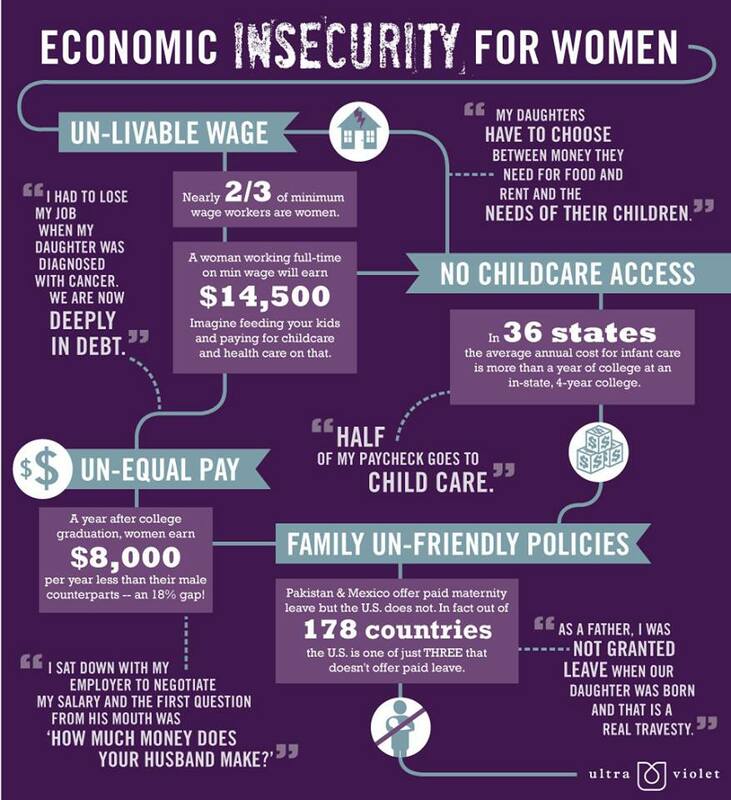 I know the above graphic focuses on extended, paid maternity leave, but there are a few other things to consider. Extended, paid leave might be available in other countries, but think about the burden on companies/employers that creates. They are set up to pay the wages of an employee that will not be there AND for someone else to do the work while they are gone. It can lead to discriminatory hiring practices, even if you create all the laws to keep it from happening. Why not go at it from a different angle? Infant at work policies will help get moms back to work sooner. This typically means that infants are welcome with new parents at work until the age of six months or so (AKA when they become mobile). In manufacturing and service positions, this can be difficult, but if you have onsite childcare, problem solved! There is also the tendency for policies to allow mothers some time with their new children, but paternity benefits are sorely lacking in America. I really feel that the truest of feminist ideals supports not maternity/paternity benefits but parent benefits.